Health and legal issues often go hand in hand. A woman hospitalised with domestic violence injuries may need legal help to get an AVO. Someone experiencing drug and alcohol issues could be self-medicating due to a debt they don’t know how to deal with. The housing problems of a parent with a sick child could affect their ability to bring their child home. Compound issues like these can’t be solved with medical or legal help alone. That’s why the Health Justice Partnership was born. 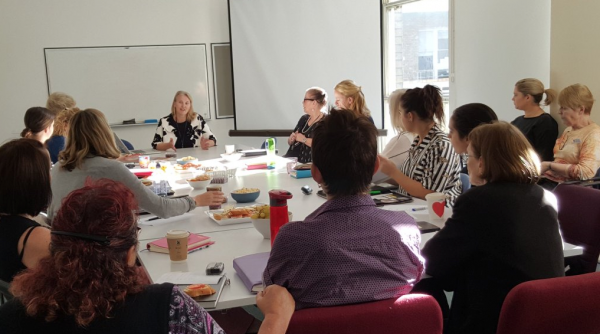 The Health Justice Partnership (HJP) between Redfern Legal Centre (RLC) and Sydney Local Health District (SLHD) is a NSW-first model which provides access to justice to vulnerable patients. This innovative model brings legal support within the hospital walls, to ensure the most vulnerable people have access to legal help when they need it most. Two days per week RLC solicitor Sue-Ellen Hills works with staff from the Royal Price Alfred Hospital to provide onsite legal support to patients. HJP is an early intervention program, with a two-fold approach. The RLC solicitor teaches hospital staff to identify legal issue for patients so they will know when to refer patients to HJP. Then she can assist patients to solve their legal issues and advocate for them to improve their situation. RLC’s CEO, Joanna Shulman is very proud of what the HJP has achieved so far. “The HJP enables the respective professions to work together to improve the holistic heath of patients. This not only helps individuals but alleviates the strain on the healthcare and legal systems,” she said. This is the first hospital-based, HJP in NSW. Until June 2016, the service is part- funded by the Gandevia Foundation. Government budget shortfalls mean HJP relies on further external funding to continue providing this unique service. The Law Society of NSW Journal featured an article in August 2016 on the HJP and solicitor, Sue-Ellen Hills. An evaluation of RLC's HJP was conducted in late 2015.